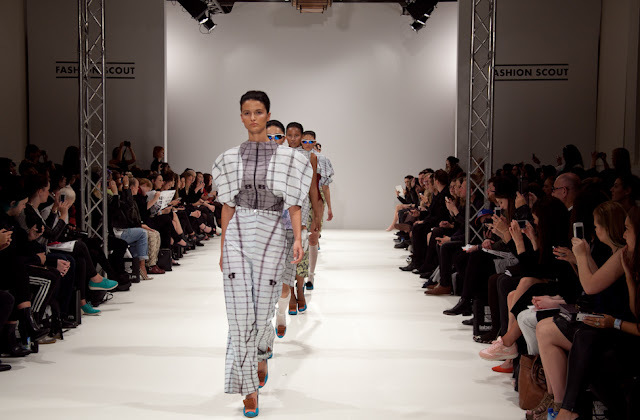 Spring Summer 2014 marks the fourth consecutive year that the Swedish School of Textiles has showcased the creme de la creme of graduate work at the Freemasons Hall. Class of 2013 included Anna Margareta Svensson, Elias Hogberg, Emelie Ahlner and Emelie Arvidsson, each of whom displayed the classic experimental and abstract style of graduate collection. 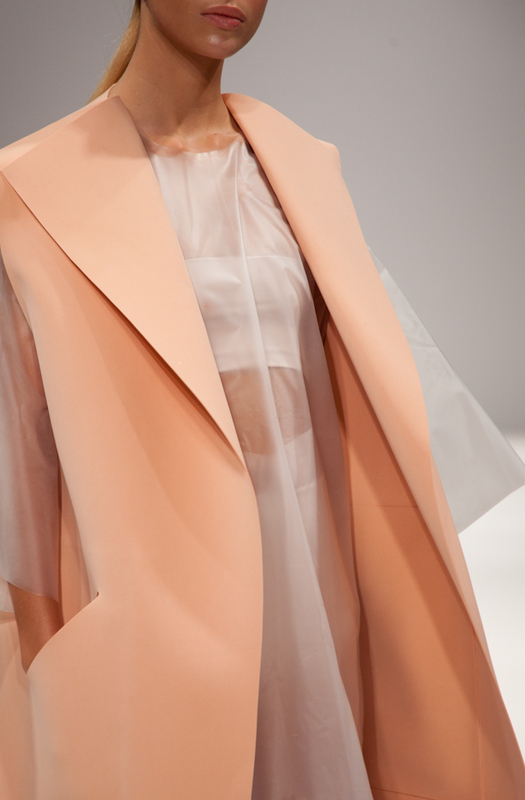 Anna Margareta Svensson's collection of pastel coloured garments and clean cut lines displayed the essence of simplicity that Swedish fashion is known for. The exaggerated volume and unusual fabric choices mixed with conventional elegance made it easy to imagine this collection being worn by the sophisticated and stylish on the streets of Stockholm. 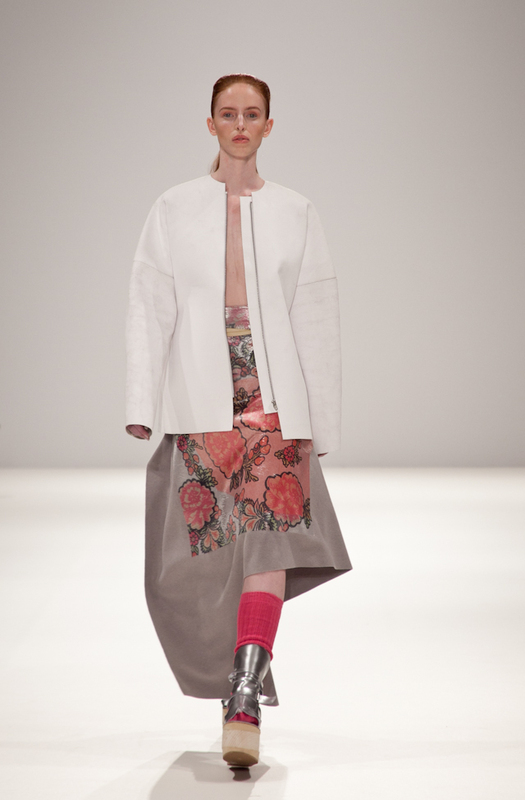 Emelie Ahlner took us back to the innocent and playful days of our youth with her graduate collection. Models looked as if they had walked out of a Rob Ryan paper cutting with their garments made from laser cut fabrics and acrylic embellishments. Dresses with matching trousers were designed from fabrics in iridescent shades of purple, green and pink, creating a uniformed complexity that brought together a whimsical essence of youth with a sharp, space age nod to the future. Elias Hogberg's graduate collection also channelled a youthful vibe with models dressed in cocoon like jumpers, layerd with thick printed fabrics in shades of pink, burnt orange and green. Definitely experimental, this collection showcased the technical abilities that graduates from the Swedish School of Textiles possess and the creativity needed to create a daring but wearable collection. We cannot help but love the fact that Hogberg's work reminds us of 'Where The Wild Things Are' making it a firm favourite from the show. The standard of this year's show was just phenomenal and the variation of the designs on show just went to prove the high standards and quality that the school is know across the world for.